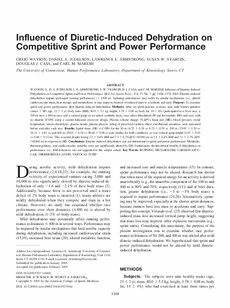 Purpose: To examine sprint and power performance after diuretic-induced dehydration. Methods: After six sprint practice sessions, nine male former sprinters (mean ± SD; age, 21 ± 2 yr; body mass (BM), 80.0 ± 5.2 kg; height, 1.78 ± 0.08 m; body fat, 14 ± 4%) participated in a 50-m race, a 200-m race, a 400-m race, and a vertical jump on an indoor synthetic track, once when dehydrated (40-mg furosemide; DD) and once with no diuretic (CON) using a counter-balanced crossover design. Plasma volume change (%ΔPV), heart rate (HR), blood pressure, rectal temperature, serum electrolytes, plasma lactate, plasma glucose, rating of perceived exertion, thirst, and thermal sensations were measured before and after each race. Results: Sprint times (DD vs CON) for the 50 m (6.72 ± 0.28 vs 6.73 ± 0.29 s), 200 m (25.95 ± 1.20 vs 26.21 ± 1.42 s), and 400 m (59.01 ± 4.26 vs 58.68 ± 3.68 s) were similar for both conditions, as was vertical jump height (0.67 ± 0.10 vs 0.66 ± 0.11 m). This occurred despite losing 2.2 ± 0.4% BM and 7.3 ± 6.7%ΔPV (50/200 m) or 2.5 ± 0.4% BM and 7.1 ± 2.7% %ΔPV (VJ/400 m) in response to DD. Conclusions: Diuretic-induced dehydration was not detrimental to sprint and power performance. Metabolic, thermoregulatory, and cardiovascular variables were not significantly altered by DD. Furthermore, the theoretical benefit of dehydration on performance (i.e., BM reduction) was not supported in this subject cohort.